How Midhurst and The Spread Eagle hotel have remained a secret baffles us. Before last weekend we hadn’t really heard of it either, but by the end of our visit we agreed that it was the best country hotel we’d ever stayed in (and the best dog-friendly hotel too), and one of the prettiest towns we’ve visited – all within an hour’s drive from London. 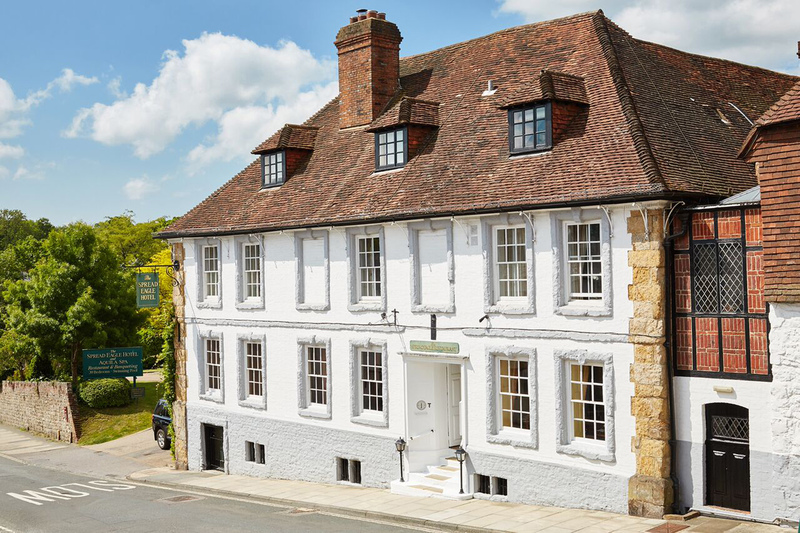 Midhurst is a picturesque historic market town in the heart of the South Downs National Park in West Sussex, with surrounding Disney-style countryside – imagine streams, weeping willows, little stone bridges and lots of wild flowers – perfect for ambling country walks. The town itself has castle ruins to explore, a pretty high street of boutique interior and homeware shops, an old town square still with old stocks, and beautiful old houses on quiet streets where all you can hear is birdsong. 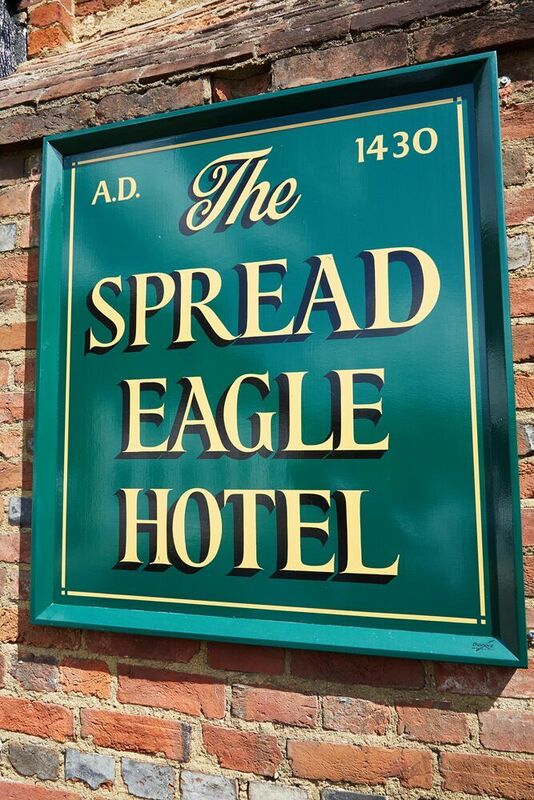 The Spread Eagle hotel sits in the middle of said town – a hotel that dates back to 1430 (it’s kept the same name all those years). 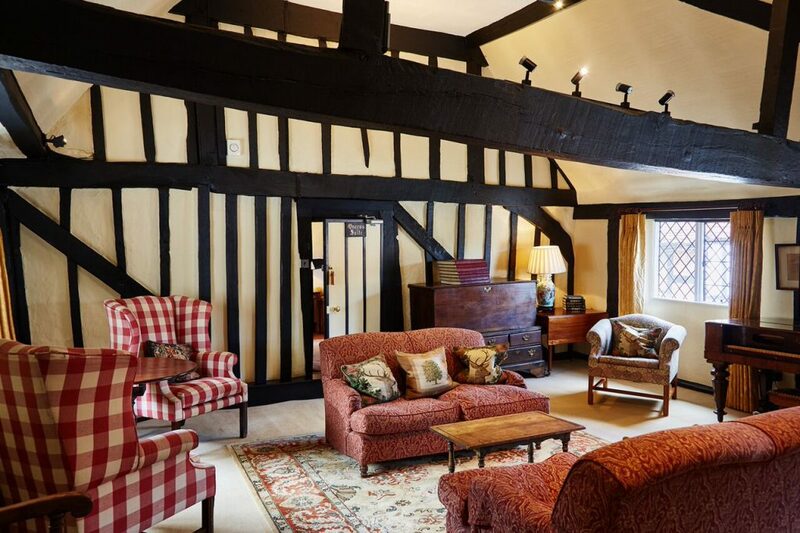 The charming former timbered coach-house is one of England’s oldest coaching inns, and has retained its heritage, history, character and charm for nearly 600 years. The hotel is just the right balance of old meets new, combining traditional touches like an inglenook fireplace, creaky stairs and floor boards, oak beams, leaded-lined windows, the only original wig room left in the country and other interesting nooks and crannies that harbour old manuscripts, antiques and even a suit of armour – all testament to its longevity – yet providing every contemporary comfort with brand new monsoon showers, roll top baths, and a modern spa with sauna, steam room and swimming pool. 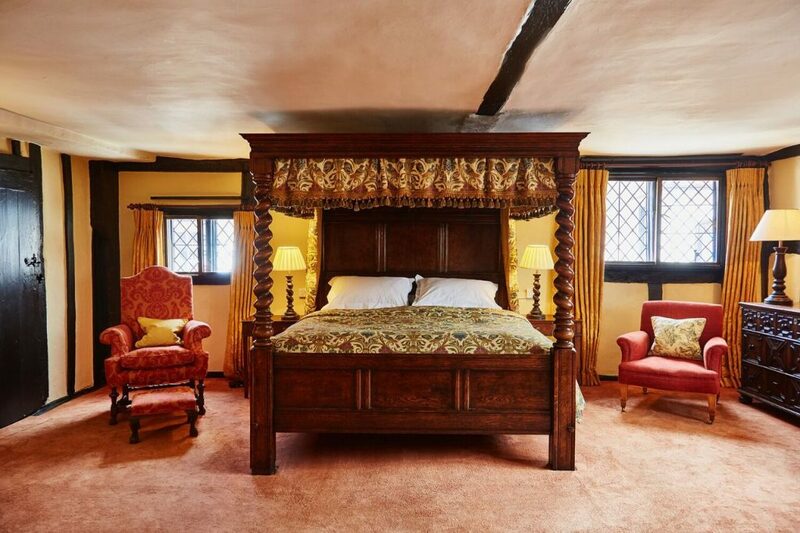 The room we stayed in – The Queen’s suite – is literally fit for a queen, having been graced by Queen Elizabeth 1st in 1591, as well as Nelson and Shakespeare. And it’s super dog-friendly to boot! We signed up for the hotel’s Muddy Paws package, which includes overnight accommodation with a three course dinner and breakfast for two, full use of the spa facilities & swimming pool plus The Spread Eagle Doggie Welcome Kit which includes a cosy dog bed, food and water bowls and tasty meals, and even a ‘Ruff and Tumble’ drying coat to take home – all for just £252. We parked the car (free parking) in the hotel’s small car park and checked in. There was a pretty patio where guests were enjoying drinks and lunch in the sun, leading to an airy conservatory with reading areas. We walked through the conservatory into the main house where there was an old wooden staircase, wood-panelled walls, and a cosy restaurant with enormous inglenook fireplace. We checked in and were shown to our room – The Queen’s Suite. The hotel has 39 individually designed bedrooms, all furnished with antiques (some with four poster beds), adding to the period feel and reflecting the history of the hotel. There are some fascinating stories associated with many of the rooms: a secret passage reputedly used by fleeing smugglers, and a wig closet that may be the last one left in a hotel in England. To get to our room we walked down the corridor up some little steps into a large living space, which had a lockable door – meaning it could be private to your room if you wanted it to be! Entering our room was a serious wow moment – you walk through your own private living area (separate from the other living area shown above) into an enormous bedroom with a generous four poster bed, seating areas, built-in closet and a modern bathroom (but with original wood beams) with monsoon shower and roll top bath. With the Muddy Paws package there were some welcome treats laid out for our pup – they’ve even thought of poop bags! The suite is of course named after Elizabeth I who stayed in the room and watched a performance in the square below from her window. Her en-suite wig closet remains, now with antique dressing table and handy plug point (dating back to 1430, this is believed to be the only wig closet still in existence, pretty cool). With our bags dropped off, we went to explore the town and surrounding South Downs countryside. The hotel suggested a pretty route to the Cowdray ruins, and also recommended a few longer routes should we feel like it (we didn’t). We walked back through the pretty town to make the most of the hotel’s spa. The spa is through the conservatory in a light, bright space. 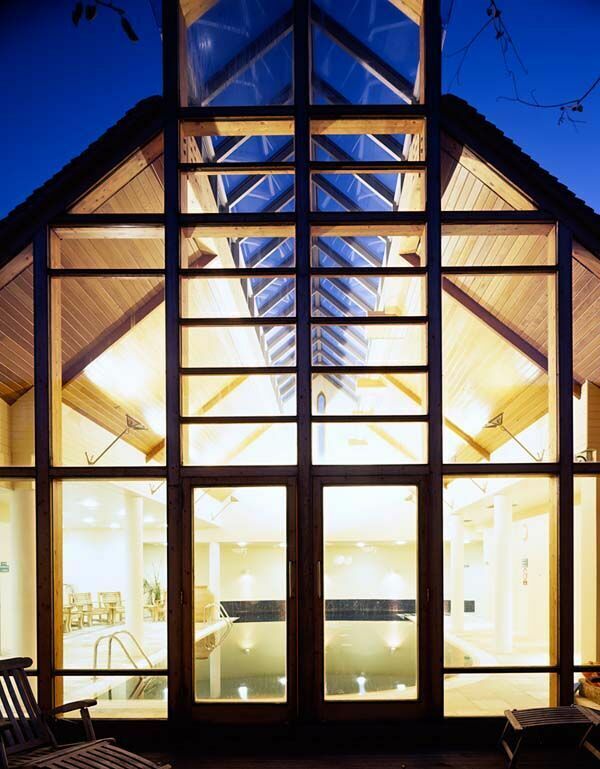 Behind the small reception area you’ll find a stunning indoor swimming pool tiled with deep rich blue mosaics outlining an eagle, with a Scandinavian-style vaulted wooden ceiling above, plus a sauna and steam room, gym, fitness room with a schedule of classes available, and six treatment rooms. I booked myself in for the South Downs Soother spa treatment, a 90-minute top-to-toe relaxation treatment, and was taken to one of the brand new treatment rooms up some stairs. Much like the rest of the hotel, the treatment room incorporated old features such as exposed beams, but with a fresh feel, like new pretty wooden shutters. My therapist started the treatment with a warming cup of the spa’s White Apricot tea (an awarding-winning Gold Taste fusion tea from Camilla’s Tea House, packed with anti-oxidants) and a bubbly foot bath and foot scrub, then asked me to lie face down on a plastic sheet covered heated water bed. She brushed my body with a body brush to encourage lymphatic flow, then applied mud to my back and asked me to roll over so she could apply the same to my arms and legs. She folded the sheet inwards to cover me under the towel, and got to work on my face, scalp, neck and shoulders. A soothing facial with Temple Spa’s Trufflesque anti-ageing mask, followed by a relaxing décolleté, shoulder & neck massage. I’m ashamed to say it certainly did the trick as I fell asleep mid treatment! I woke up when it was time to remove the mud with a warm flannel and apply a lotion. After the treatment she lead me into their relaxation room, ‘The Nest’, where I was given a glass of Sussex sparkling wine and a lavender filled Forty Winks Eye Mask to end the treatment. Feeling fully pampered, I met my boyfriend out on the pretty patio for a pre-dinner Gin & Tonic in the sun. With 72 different gins to choose from, it was a tough call, but I had the rhubarb gin with a berry tonic, whilst he had the rosemary gin and tonic with an olive garnish. When the sun started to pull away, we headed to the candle-lit restaurant to a table by the window. The restaurant was full on a Sunday night, mostly couples celebrating a special occasion. There was a lovely original inglenook fireplace with old oak beam above it from which linen covered pudding pots hang. Inside are Christmas puddings, some dating back 200 years – it’s the hotel’s yuletide tradition that guests are given two Christmas puddings, one to eat and the other to leave dangling until their next visit. With a taste of Gin & Tonic we decided to try another gin instead of wine, and I tried a pink peppercorn gin & tonic – crisp, peppery, slightly bitter and very refreshing. We glanced at the menus – starters looked great, from roasted fish soup or cheddar soufflé to the cured salmon Gravlax. I ordered the grilled scallops with Granny Smith apple – light, subtly fragrant and zesty, and he ordered asparagus with hollandaise sauce and a poached egg. The mains included an aubergine and red onion Imam Bayildi with chargrilled halloumi, and a duck breast in a cherry sauce, but we both opted for light fish options; the Parmesan crusted Plaice for me (served with aubergine puree and tomato salsa), and the Parma ham wrapped cod for him, served in a chorizo tomato sauce with cuttlefish. With little room left for dessert, we shared the fine apple tart with butternut sauce and vanilla ice cream, and took our Gin & Tonics up to our room to drink in the snug in front of a movie. The following morning, we woke up bright and early to enjoy an early swim in the pool, then headed to the breakfast buffet. Aside from the cooked breakfast menu, there was a generous spread of juices, vodka to make your own Bloody Mary, homemade birchler muesli and fruit, and a piña colada salad with optional rum! Two full English breakfasts later (mine the vegetarian with veggie sausage), we drove back to London Monday morning, ready for the week ahead. The Spread Eagle was the perfect place to celebrate our anniversary. It’s ideal for couples looking for a little bit of time out and to explore the nearby Sussex Downs, and for those interested in racing Goodwood Racecourse is close by too. 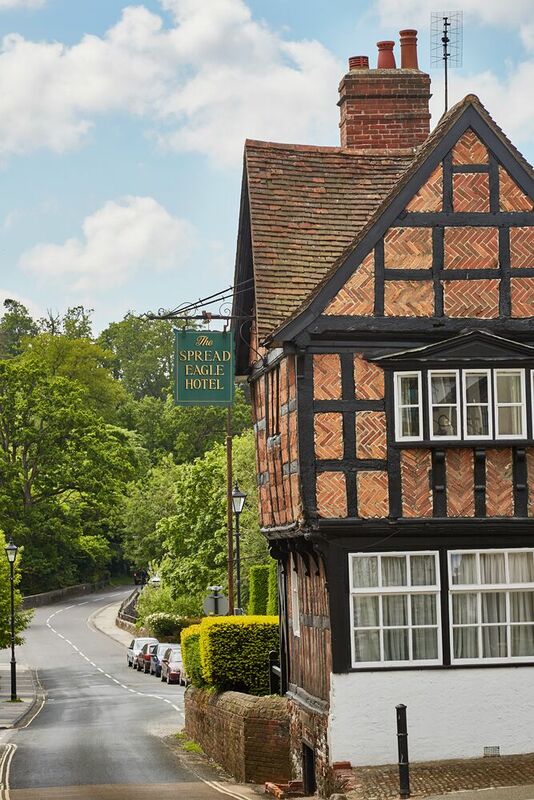 With gorgeous rooms, a great spa and restaurant, and both nature and shopping on the doorstep, it’s amazing value for money and the best dog-friendly hotel we’ve ever come across!